Do I Have Ambrosia Beetles? What is an Ambrosia Beetle? Ambrosia Beetles are in the weevil family, they live in nutritional symbiosis with Ambrosia fungi. They are opportunists who attack weak, dying, or dead trees. The female beetle lands on the dying or stressed tree and bores a tiny hole, tunneling into the heartwood of the tree where she will lay her eggs. While she does this she spreads a fungus through the tunnels that provides nourishment for the Ambrosia Beetles. What happens to my tree? Ambrosia Beetles tunnel through the xylem of the tree then open their tunnels into cave-like galleries where they lay eggs and hatch larvae. The fungus the beetle spreads through the heartwood of the tree is used to feed the beetles and the larvae, they do not actually eat the wood of the tree. The fungus spread by the beetle and the excavated saw dust blocks the flow of water through the xylem, further weakening the tree. 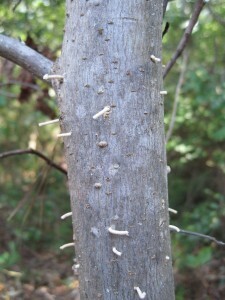 The first sign of infestation will be small amounts of sawdust poking out from the bark of the tree. This is from the excavation of the heartwood of the tree. The sawdust tubes are easy for wind and rain to knock away; make sure to look on the bark and at the base of the tree at the root flair for saw dust. The other signs to look for are die-back of branches in the summer. Look for fading and wilting of infested branches. How do I treat Ambrosia Beetles? Unfortunately, once an infestation of Ambrosia Beetles has begun there is no way to treat the tree. The fungus the beetle spreads is not treatable and will kill the tree by blocking its access to water. A systemic treatment would be ineffective at this point, as the beetle does not feed off of the plant material. Infested trees and shrubs should be removed from the property and destroyed to prevent re-infestation of other plants and trees. It is important to remove the tree from the property and have it properly disposed of, Ambrosia Beetles can return and plague other trees in your yard. The best way to prevent Ambrosia Beetles is to keep your trees healthy all year long. Fertilizing frequently, maintaining the proper pH balance of your soil, proper soil moisture, and regular pruning can lower your risk of infestation and other tree diseases. A professional arborist can help keep your trees healthy year round with proper pruning, fertilization, and management.